The Martin ego 02 is a new approach to creating flower effects. It features a patent pending color system that offers more than 200 color combinations, and a manually selectable image effect (etched gobo or textured gobo patterns). Gobo slots are interchangeable so DJs can incorporate their own custom patterns or accessories. The Martin ego 02 is part of a series that brings brand new benefits to clubs and DJs; there are improvements in every area: features, control, optics, durability, handling and design. 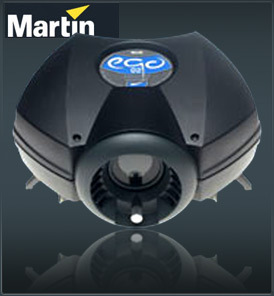 Martin ego 02 also features a variable color and rotation speed adjustment. The ego’s cool, composite design houses a powerful 250-watt, 1000-hour halogen lamp, superlative optics, and a precise focus adjustment that enables super crisp projections. Radical new image effects make the Martin ego 02 truly unique. A convenient handle and lens protection ring make for easy transport and handling, and a remote control is also available.